Jesse Nelson discovered first-hand that science isn’t all about lab coats and microscopes as he trudged knee-deep in Darwin's mangroves as a part of the 2008 Siemens Science Experience. The 14-year-old Our Lady of Sacred Heart College student was visiting Darwin from Alice Springs to join other budding scientists from around the Territory for the fun and intrigue of the three-day event. "It's pretty good. We're doing heaps of exciting stuff," Jesse said. CDU supported and hosted the event aimed at opening the world of science, engineering and technology to year nine science students through hands-on adventures and interactive lectures. This year's theme, “Science in the tropics”, emphasised the role science plays in human health and well being. Resident mangrove expert, Dr Keith McGuinness took students through the Rapid Creek mangroves, teaching them about the crabs and their unique environment. "The aim is to give students different ideas of the various fields in science available," he said. Capturing birds for analysis and release, exploring fauna in Darwin's mangroves and building slot cars for racing were among the projects on offer this year. For the first time, Alice Springs students were able to take part in the annual event held nationally at more than 35 universities and tertiary institutions across Australia. 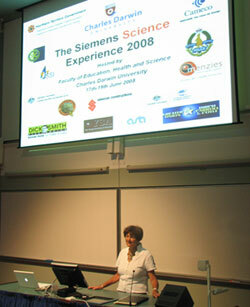 Event chairperson and senior lecturer at CDU's School of Environmental and Life Sciences, Dr Diane Pearson said that this year’s program was extremely well received and gave students a healthy insight into the world of science.